Put it in your pocket and go traveling, when need communicate with your friends, opening his body began to typing. Fully functional to all three major operating system: IOS/Android/Windows, and features system-specific function keys for each operating systems. Bluetooth supported devices such as laptop, computer, tablet, smartphone can easily paired and gain quick access to common functions, such as volume level, playback control, copy paste text, and more. The whisper-quiet, low-profile keys bring a whole new level of comfort to your fingertips. What's more, keep all your most-used functions and media controls closer than ever Windows-dedicated hot keys. The construction of this scissors-kick keys can be used more than 3 million times continuously. Made of aircraft-grade aluminum for superior rigidity, anodized matte process creates excellent sense of touch. Built-in rechargeable Li-polymer battery provides more than 60 hours of effective usage time, on a single charge. 1. This keyboard doesn't support the Win 8 Mobile. 2. For Android 4.4 users: The Caps Lock indicator may not light, but will still function normally. 3. The keyboard will automatically go into power savings mode after 10 minutes of inactivity. Press any key and wait 2-3 seconds to wake the keyboard. 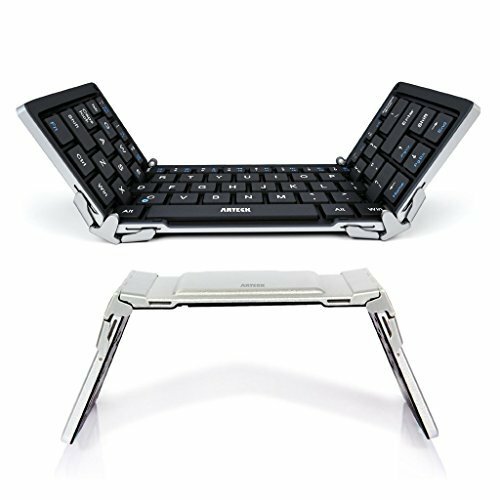 Folding bluetooth keyboard: folding and ergonomic bluetooth keyboard, Pocket size, sleek and slim design. Compatible 3 major operating system: iOS / Android / Windows. Works with most bluetooth supported devices. Ergonomic & durable design: Aircraft-grade aluminum alloy texture for superior durability, low-profile keys offer quiet and comfortable typing. Built-in rechargeable Li-polymer battery provides more than 60 hours of effective usage time, on a single charge. Auto power off and sleep mode function helps to conserve battery. Package contents: Arteck Foldable Bluetooth Keyboard, USB charging cable, welcome guide, our 24-month warranty and friendly customer service.